In writing this, I desperately want to tell the world how much I love bhangra music, to list and give examples of some of the best Asian artists that I know and to roundly extol the wonders and beauty of this exciting and inspiring art form. However, I would be doing so with the gnawing unease of not really understanding, of having never really understood, exactly what modern bhangra is. Asian musicians were becoming increasingly popular throughout the 1990s when I was growing up, and I was captivated by such musicians as Talvin Singh, The Asian Dub Foundation and Panjabi MC. Asian influence on mainstream Western pop was also increasing, and it had become de rigueur for a single to have a 'bhangra version' as a b-side. There was, however, a lot of confusion about exactly what bhangra was. For many, it just meant something with a vaguely Indian feel or sound. This was particularly evident in the so-called bhangra versions of songs, which often had only the merest of Asian influence, perhaps a sitar riff or a dhol rhythm (one of the worst examples of this is All That She Wants Bhangra Version by Ace of Base). There was also a certain amount of snobbery and conservatism among bhangra-purists who would object to the traditional form mixed with modern elements such as DJs, drum sets, keyboards and synthesizers. 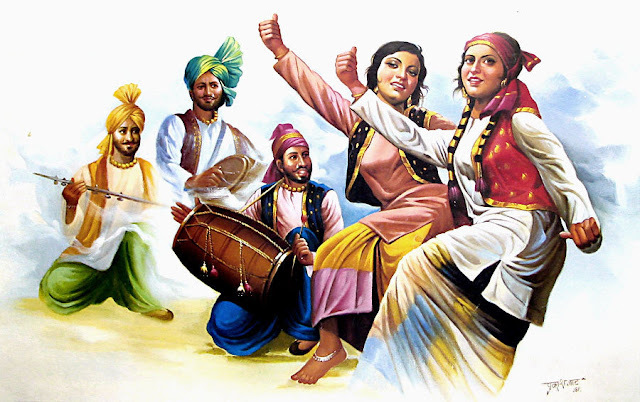 All I know is this - bhangra is a broad and expansive term covering the musical styles and influences that originate from that Indian, Pakistani and Punjabi regions of Asia. Some try and exercise tighter definitions and some tend to drop the word bhangra altogether (some of the above musicians don't even list bhangra as one of their genres, preferring terms such as Asian Underground). Regardless of the semantics, bhangra-influenced music is exciting, passionate and deeply energising. I have included videos of some of my favourite musicians - I hope you enjoy them and I look forward to receiving indignant messages of correction. I remember some of these from when I was young! Panjabi MC was all over the TV and radio back in the day. I never really gave it much thought, but now that you mention it, the 90s really were a time where music explored a lot of different ethnical styles (is ethnical the right word?). I specifically chose hits from this genre for the videos, as people might recognise them and think: "Oh yeah! I liked that!" And we would generally say 'ethnic' rather than 'ethnical' (although people object to that too!). I didn't know if ethnic (thanks) was the politically correct term for uhm... well... whatever; that was indeed the reason why I asked if it was the right word. You're right, you can't say you like Asian music if you're only referring to a part of Asia. Besides, I can imagine there are probably multiple genres of music typical for the Indian sub-continent, each with their own specific characteristics. Musical preferences are hard to put into words!